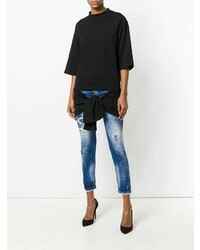 Dress in a black v-neck sweater and Dsquared2 Cool Girl Jeans from farfetch.com for a neat and fashionable look. Complement this look with a pair of silver leather low top sneakers and ta-da: this getup is complete. Dress in a white and red and navy plaid dress shirt and navy ripped skinny jeans to pull together a seriously stylish and modern-looking off-duty outfit. Does this ensemble feel too dressy? Enter white canvas low top sneakers to jazz things up. Assert your styling expertise in this casual combo of an olive military jacket and Dsquared2 Cool Girl Jeans from farfetch.com. Lift up your ensemble with the help of a pair of beige suede ankle boots. 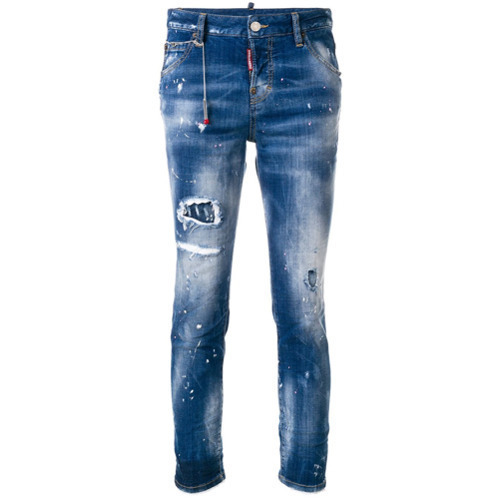 For To create an off-duty look with a twist, you can easily dress in a dark green vest and Dsquared2 navy ripped skinny jeans. 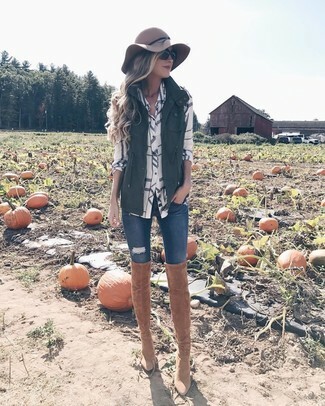 To introduce a little depth to this outfit, add a pair of tan suede over the knee boots to the mix. For a cool and casual ensemble, dress in a light blue dress shirt and navy ripped skinny jeans — these two pieces fit nicely together. Feeling creative today? Smarten up this outfit by slipping into tan leopard suede loafers. A white silk long sleeve blouse and Dsquared2 Cool Girl Jeans from farfetch.com are a nice outfit formula to keep in your sartorial collection. And if you wish to immediately kick up this ensemble with a pair of shoes, complement this look with silver leather mules. Definitive proof that a pink puffer coat and Dsquared2 Cool Girl Jeans from farfetch.com look amazing when teamed together in a casual ensemble. Make a bit more effort now and complete your getup with a pair of black cutout leather ankle boots. This pairing of a black leather biker jacket and Dsquared2 Cool Girl Jeans from farfetch.com combines comfort and confidence and helps you keep it simple yet trendy. If you need to instantly dial up this outfit with a pair of shoes, add black suede ankle boots to the mix. If it's ease and functionality that you appreciate in an ensemble, try pairing a light blue dress shirt with Dsquared2 Cool Girl Jeans. Balance out this getup with a more polished kind of shoes, like this pair of light blue leather heeled sandals.